What a month April turned out to be! We thoroughly enjoyed taking a Journey through the Cuisines. Each of my BM Buddy who joined me in this journey did a fantastic job and thereby increased our Bookmarks by many folds. 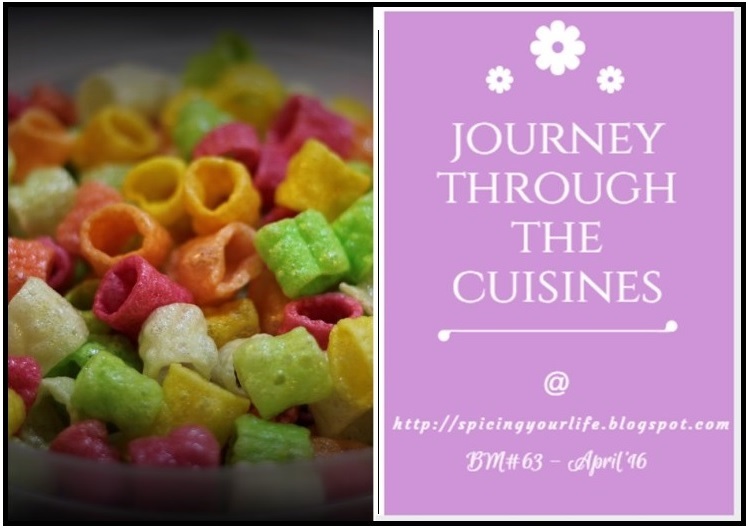 Coming to my theme, I decided to do a series on A to Z Maharashtrian Sweets. Do read up that to know how I started on the journey and the perils I faced as I cooked up this series. A to Z is challenging, on top just Sweets was beyond comprehension. Even tougher was the thought on who will eat all that sweets I cooked up. I don’t even want to see my scale for a while! Anyway, if you are landing here for the first time, just to update you, we are a group of Food bloggers doing a Blogging Marathon every month, 3 days all 4 weeks, each month. However during April and September, we do 26 days of nonstop blogging with Sundays off. April 2015 was Fire up our Ovens . As I knew before, even though I had the list ready, I started cooking very late. I managed the entire cooking during March and all the weekends were only making sweets. It surely was a tough task having so many sweets on hand, with very few takers. Blogging Marathon # 48 – 3 Day Marathon for 4 weeks! Blogging Marathon #8 – 7 Day Marathon! Kudos for taking up the sweets theme. I enjoyed and learnt some new Marathi sweets through this marathon. Thanks for taking up this challenging theme. Choosing a different region and then choosing sweets is tough bit as always you rock Valli . Now all know where to go for Maharashtrian sweets . Fantasic work ???? Kudos to you to come with 26 differents sweets and enjoyed thoroughly the visual and virtual treat of your Marathi sweets. Well done Srivalli. This is surely an impressive list if Maharashtrian sweets, Valli. You did an amazing job last month..
Wow Valli, kudos to your creativity to come up with such an amazing theme. I would never ever have thought of doing sweets from another state. You did an amazing job. I'm drooling over the sweets as I type. I second Pavani, you were really adventurous Valli. You nailed it???????? you are very gutsy in choosing the sweets category. I cannot think of making so many sweets and dread the sugar over load. More so because I can't resist these sweets:) Lovely series and a fantastic roundup. Thanks for the virtual treat! Awesome Valli.Hats off to your efforts ,your creativity and innovation.You did a fab job in presenting sweets from a non native cuisine. Valli, that was a great roundup. I loved how specific you got with the theme. While most of us chose cuisine or combination of cuisines you chose a cuisine and a specific course! Lovely sweets you shared all month long. Thoroughly enjoyed the marathon. Stuffed Paratha with Greens ~ Diabetic Diet! Apple Halwa ~ Two ways!